ALLICE welcomes new Kumares marriage and family therapist Nan Santiago (top) and senior peer counselor -outreach coordinator Ofie Albrecht (above). Nan Santiago and Ofie Albrecht represent two generations and two disciplines. The former is at the peak of her career as a marriage and family therapist with Kaiser Permanente in San Francisco. The latter had retired but returned to work as senior peer counselor-outreach coordinator with Peninsula Family Service, a nonprofit agency based in San Mateo. Inclined to public service, their paths converged when they joined ALLICE Alliance for Community Empowerment, the 14-year-old private nonprofit dedicated to educating for healthier, safer relationships, homes and communities. Next month, they will take center stage with their fellow volunteers at ALLICE's 13th Annual Free from Violence, a presentation-resource fair free and open to the public from 5:30-7:30 pm, Tuesday, Oct. 3 at the Colma Community Center on 1580 Hillside Blvd., Colma, CA 94014. The team is collaborating with Union Bank, the Philippine Consulate General, Pilipino Bayanihan Resource Center, Seton Medical Center/Verity Health System and the Town of Colma to stage the event. Six-time Colma Mayor Helen Fisicaro will deliver the keynote address and Philippine Consul General Henry S. Bensurto Jr. will lead the traditional Pledge to Help End Domestic Violence framed by the organization when it was formed 14 years ago. Actor and founder of SF Actors Workshop Giovannie Espiritu will share her story of being in an abusive relationship and what helped her heal. Commendations will be conferred on outstanding allies and a special award will be go to a lifetime community advocate. Early this year the all-volunteer team welcomed the Santiago and Albrecht as their newest “Kumares,” the Filipino term for friend, confidante or fellow-mother, the persona each member seeks to be to the public. They follow seasoned executive assistant Allen Capalla, Holy Child & St. Martin Episcopal Church pastor Rev. Leonard Oakes, and psychology graduate Cecile Gregorio Ascalon, who swore in to promote healthier interaction with the team the year prior. Santiago and Albrecht had known about ALLICE at work, admiring members’ commitment to their mission. Santiago’s expertise is informed by her professional dedication to families since 1986, starting as clinical supervisor with Family Service Agency Child Abuse and Treatment Division at La Casa de Las Madres then as Clinical Supervisor the following decade . She has seen first-hand the impact of abuse and violence on families, particularly the hidden victims. Children who witness their parents' unhealthy interaction are twice likely to become perpetrators or survivors, experts concur. Breaking the cycle can happen if the children see alternative behaviors that are positive, with the help of caring elders and clinicians like Santiago. As a Kumare, she vows to correct misperceptions that “this is not happening in our family” or that Filipinos are “not like the other families where abuse may be occurring” and especially that abuse must be “kept in the family” as opposed to being an issue that may be overcome with the help of a therapist. Albrecht had been closely eyeing ALLICE as a Democratic Party comrade to Alice Bulos, the community leader after whom the organization named itself. 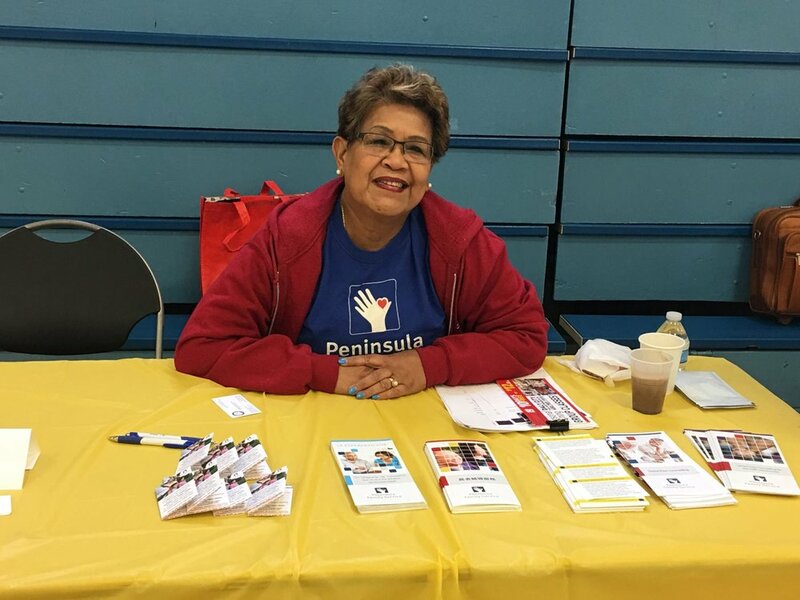 "Since I joined Peninsula Family Service more than eight years ago I became more aware of abuse among Filipino families especially the older sector," she related her involvement as a resource provider fielding questions from attendees at ALLICE events. 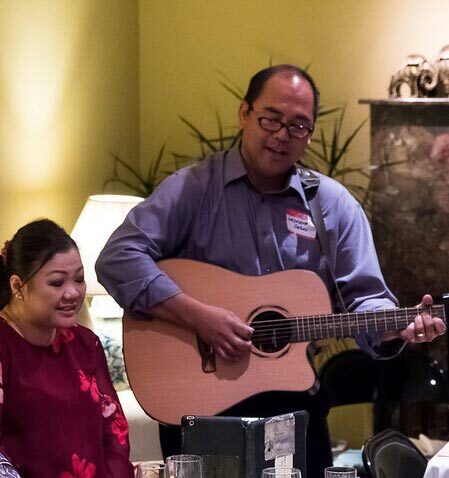 In February she attended a meeting to get better acquainted with the team upon the invitation of Lasola Malay, a monthly speaker at “Kapihan,” a support group for seniors Albrecht coordinates at the Lincoln Community Center in Daly City..
“I have learned how to listen attentively,” she emphasized a hallmark of counseling. In relation to intimate-partner abuse, she noted that she had been friends with couples whom she had never suspected but later learned were in abusive relationships. “I did not know what to do or say to them, particularly the victims. Their spouses would abuse them by yelling or insulting at them and mistreating them in public or at home.” Now she knows better. Albrecht stressed that family and intimate partner violence can happen to anyone. “ALLICE members are very supportive, collaborative, dedicated, professional, caring and fun group to work with,” praised Santiago. October is designated as Domestic Violence Awareness Month in this country, hence the team's 13th commemorative event to date. ALLICE has been showcasing the occasion with yearly presentations to break the silence on the issue, bring together community members and resource providers to end the pervasive problem. Donor allies Asian American Recovery Services, San Mateo Behavioral Health & Recovery Services, GMA News Online, Positively Filipino, Inquirer.net, The Filipino Channel, Philippine News and Philippines Today are generously supporting the community effort. This year's ALLICE president Jennifer Jimenez Wong, MFT, and vice president Elsa Agasid, FNP, will co-emcee. Resource providers led by Kaiser Permanente FilAm Association, Philippine Nurses’ Association, Health Plan of San Mateo, Center for the Independence of Individuals with Disabilities, StarVista, Filipino Mental Health Initiative, Always Best Care-Peninsula and HICAP Health Insurance Counseling & Advocacy Program of San Mateo County will offer and consult on their free services and programs. Free refreshments will be served. Prizes will be given at raffle drawing (Must be present to win). 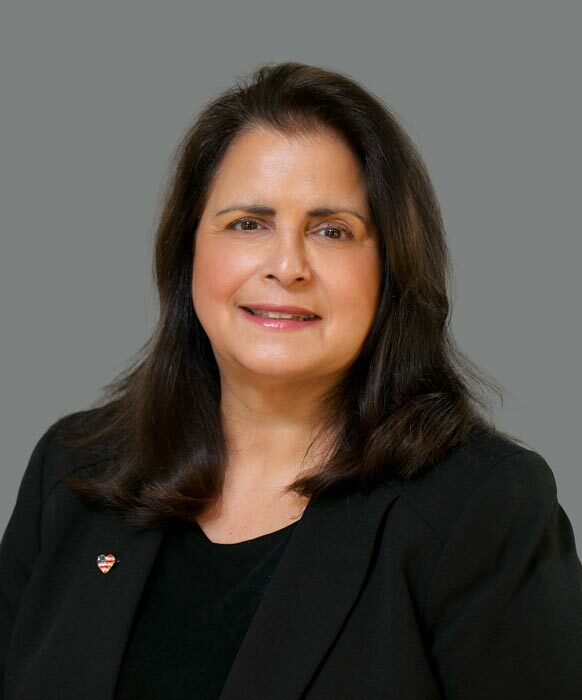 Cherie M. Querol Moreno is a Commissioner with the San Mateo County Commission on Aging and executive director of nonprofit ALLICE Alliance for Community Empowerment. She is editor at large of Philippine News, columnist for Philippines Today USA and contributor toRappler and GMA News Online.